Costa Rica is becoming a world-class scuba diving destination. Massive schools of fish, an amazing array of marine life and an ideal water temperature throughout the year has made scuba diving conditions in Costa Rica near perfect and Guanacaste one of the most popular diving destinations in Costa Rica. Join one of our Papagayo Scuba Diving Trips and let us show you why. Local scuba diving in Playa del Coco offers great dive sites such as Monkey's Head, Meros, Punta Argentina and Punta Gorda where you can expect to find manta rays, sea turtles and a variety of large schools of tropical fish. A boat dive to Isla Murcielagos, or Bat Island in English can put you face to face with a huge Bull Shark! And we may be a bit partial, but our favorite dive in Playa del Coco is the small archipelago of the Isla Catalinas. So, it is not the clear warm waters of the Caribbean, but the cool murky waters you encounter scuba diving Isla Catalinas off the coast of Guanacaste are actually the key to some of the most incredible diving experiences in the world. Murky water = lots of plankton = lots of food = GIANT MANTAS! Small sacrifice for such an incredible undersea encounter. You'll get the opportunity to see giant manta rays, swimming alongside brightly colored tropical fish and white tip sharks. In other words, scuba diving Catalina Islands = INCREDIBLE!! Join a local scuba dive from Playa del Coco, take a boat dive to Catalina or Bat Islands, obtain your SCUBA certification or maybe just dip your toe in with the Discover SCUBA Course. Whatever you want to do, however deep you want to go, we've got you covered with our Playa del Coco scuba diving in Papagayo! The Local dive sites around the Playa Del Coco offer up close encounters with many different types of Marine wildlife. You will encounter white tip reef sharks, giant schools of grunt, yellowtails, spotted eagle rays, turtles, stingrays, angel fish, octopus, frog fish and many different species of eels. 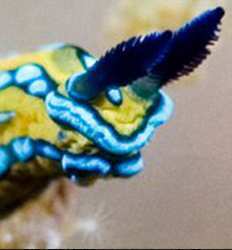 The Catalina Islands are considered among the most attractive dive sites in Costa Rica. 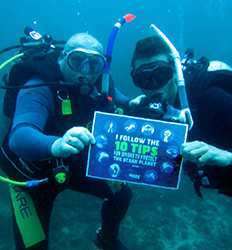 It is an area where divers often find themselves surrounded by large schools of colorful fish. But by far what the Catalina's are most famous for is rays, rays and more rays!!! 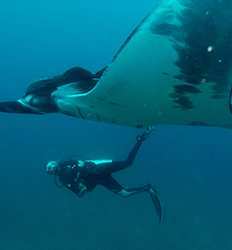 Giant Manta Rays with wingspans ranging from 14-20 ft.!!! Catalina Islands Dive deposit is $27.00 per person with 2 Tanks and $33.00 per person with 3 Tanks. This tour departs From May till November at 8:00 AM. A trip to the Bat Islands are an absolute MUST for divers. These are the areas where you are more likely to find the larger pelagics. Visitors diving The 20 uninhabited outcrops, which make up the Islands, offer no less than 30 different Costa Rica diving spots to explore. Bat Islands Dive deposit is $33.00 per person with 2 Tanks and $39.00 per person with 3 Tanks. 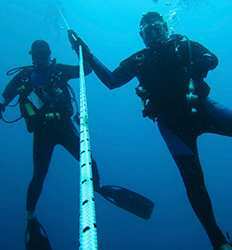 Would you like to scuba dive in Costa Rica but lack certification? The Discover Scuba Papagayo Diving course, also known as the Resort Course, offers non-certified divers a chance to experience the underwater world of Costa Rica without the time commitment or expense of a full-fledged Open Water Certification course. Discover Scuba Papagayo deposit is $25.00 per person with 1 Tank and $30.00 per person with 2 Tanks. This is the big kahuna the mother of all scuba diving classes. 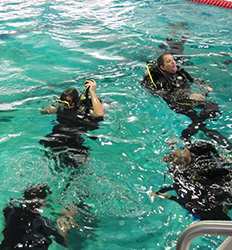 Every single person who is certified to scuba dive in the world has taken this class. Now, you can also take this class, and in the warm waters of Costa Rica instead of your cold murky waters of the northlands. PADI SCUBA Certification Papagayo deposit is $100.00 per person with Book, $95.00 per person with eBook and $90.00 per person with eLearning. The Advanced Open Water Diver course is a great way to get more dives under your belt while still learning under the supervision of your PADI Instructor. The course builds on what you’ve learned and develops new capabilities by introducing you to new ways to enjoy scuba diving.